The following is a list of books by Dr S K Kapoor. Dr Kapoor's research has uncovered new aspects of Vedic Mathematics, of a geometrical nature involving higher dimensional spaces. It should be noted that Dr Kapoor's earlier works may be hard to get hold of at the present time. There appears to be a related work by Dr S K Kapoor on Fermat Last Therorem, available in the free books section of this website (see menu on left). A copy of the proof can be found here. 3. Four courses first course learn and teach Vedic mathematics on geometry formats. 4. Second course Vedic mathematics for beginners. 5. Third course mathematics chase of Sanskrit. 6. Fourth course transcended basis of human frame. 8. Glimpses of Vedic mathematics. 9. Multi dimension of time space and time and space in Mansara. 2. Format of Ganita Sutra 1. 3. Format of Ganita Sutra 2. 4. Format of Ganita Sutra 3. 5. Format of Ganita Sutra 4. 6. Format of Ganita Sutra 5. 7. Format of Ganita Sutra 6. 8. Format of Ganita Sutra 7. 9. Format of Ganita Sutra 8. 10. Format of Ganita Sutra 9. 11. Format of Ganita Sutra 10. 12. Format of Ganita Sutra 11 16. 8. (The end Be end God). 9. Seed Space seed Seed space seed. 11. Space book chapter order/four sequential formulations first second third and so on. 1. Sequential formulations one two three and so on. 1. Geeta study zone chase step I. 4. Electronic configurations tables (chapters 1 to 18). 5. Chase as manifestation layer (3 4 5 6). 1. Lesson 1 Ganita Sutras. 2. Lesson 2 Ganita Upsutras. 3. Lesson 3 Ganita Sutra 1. 4. Lesson 4 Number cone. 5. Lesson 5 Domain boundary ratio. 6. Lesson 6 Geometric components formulation. 7. Lesson 7 Existence of higher spaces. 8. Lesson 8 Outward and inward expansions. 9. Lesson 9 Geometries of 3 space. 10. Lesson 9 (2n+1) geometries for n space. 11. Lesson 11 Requirement of 960 cubes to net 6 space domain. 3. Lesson 1 Counting with rule from 1 to 10. 4. Lesson 2 Number line. 5. Lesson 3 Counting with rule from 10 to 19. 6. Lesson 4 Counting with rule from 20 to 29. 7. Four weeks training course for first stage Vedic mathematics teacher. 8. Group one Lesson 1 to 10 for first week of first semester of training course. This is another book in series of five previous books of Dr. S.K. Kapoor. This very gently is taking us towards is intuition and conviction as that Vedic knowledge is lively within rays of the sun. In his words Vedas are written on rays of the sun. He feels blissfully about everything all as a single domain and a single discipline of knowledge. Step by step his thesis about nature as common source of all ancient wisdom is unfolding blissfully. The beauty with which the ancient wisdom unfolding as Ganita Sutras and number value formats as organization formats of orthodox and classical English Vocabulary is preserving is enchanting. It stimulates the intelligence. It stimulates and perfects the intelligence transcending the manifested formats of formulation as English Vocabulary has started unfolding through this approach. It is wonderfully embracing humbleness to get posed with uncomfortable situation eluding answer as to how it all stood designed and then at what point of time and then further by whom. 308 pp. Introduction to functional domain of Vedic mathematics, science and technology. The theme of the book is really very refreshing. That the approach of Vedic systems is intelligence field based, is the key which is to help students of Vedic mathematics, science and technology to approach the discipline, the way it deserves to be approached. Need of hour is to reach at the basics of ancient wisdom to remain on the positive side of flow intelligence. The main stream flow of intelligence follows the path of fundamental unity of human mind, parallel to it runs the organization format of whole range of knowledge as a single discipline. The present set of five books of Vedic mathematics basics, sequentially cover all fundamental phases and stages of teaching and learning of Vedic mathematics basics on their basis on their basis on first principles and aim to attain perfection of intelligence for the students. About The Author: Dr. S. K. Kapoor is well known authority upon the ancient Discipline of Vedic Mathematics. He has been devoted for the cause of revival of the ancient discipline. He has been awarded Guru Gangeshwaranda Veda Ratna Puraskar 1997 by Bharatiya Vidya Bhawan for his excellence and research in the field of Vedic Science and Mathematics. From the conceptual format of Doctoral thesis of Dr. Kapoor titled 'Mathematical basis of Vedic Literature' to his first book 'Vedic Geometry', to the whole range of books (Fermat's last theorem and higher spaces reality course, Foundations of Higher Vedic Mathematics, Goldbach Theorem, Glimpses of Higher Vedic Mathematics, Learn and Teach Vedic Mathematics, Vedic Mathematics Decodes, Space Book, Practice Vedic Mathematics Skills) and now the present set of five books (The Teaching of Vedic Mathematics, Learning Vedic Mathematics on First Principles. Vedic Mathematics Basics, Vedic Mathematics Skills and Vedic Geometry Course) is a big range which promises for re-construction of Vedic mathematics of its ancient wisdom glory. range for trancendence there from. Hardback, 78 pages, A4 size. The information on the Internet for the book of this title is confusing, it appears to have been printed under three different ISBN numbers (also it has a tendency to have the wrong book image associated with it for some reason). N.B. for some reason this book and "Vedic Mathematics Skills" details get mixed up on the internet. 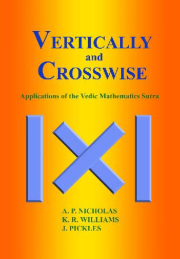 This volume is part of a set of five books of Vedic mathematics that sequentially cover all fundamental phases and stages of teaching and learning of Vedic mathematics basics for the benefit of both students and teachers in the field. The theme Vedic Mathematics is an absorbing and emerging field. It poses a new challenge for the systems analysts interested in the organisation potentialities of the space. The postulates and axioms are of interesting features. It accepts the emergence and existence of Black substance along with the space. The theory puts forward as that Sun-light flourishes Black substance affine state of space into sequential dimensional order for sustenance of Existence phenomena as an automation process. The conclusion of the chase study are also very absorbing as that the folds of human frame run parallel to the consciousness fields sustained by the inner folds of the transcendental worlds (5 space). The theory of intelligence field transforming into consciousness field of automation for riding carriers within rays of the Sun and that the carriers within the Sun being embedded with intelligence is worth further chasing as it provides for many unanswered questions about the Existence phenomena which transcends the human body and goes to the domain of Atman/Self/Being. The study takes up-till the Existence phenomena as human body and much wider domain beyond that: atman to paramataman domain remains to be experienced. No doubt this study, Space Book, has all these features and simultaneously it raises our hopes for chase of higher reality states in a more realistic way of availing best mathematical tools as the numbers and the geometric formats are. The Vedic Mathematics processing systems are in tune with the maturity process of 'innocence fulfilled young minds'. It is because of it that the Vedic Mathematics teacher while interacts with the pure innocence during teaching of first principles of mathematics to young minds, it in a return puts the teacher on the purity path of self evolution of one's own comprehension and insight level, as well as to the degree of perfection of intelligence which stands attained by the teacher. This way, teacher of Vedic Mathematics, during discharge of teaching responsibilities, in return is benefited much more than that what is imported to the young ones. Vedic Mathematics is an ancient discipline, which has remained dormant for some centuries but Swami Tirtha Ji Maharaj focussed on the potentialities of Ganita Sutras, which consist of 16 Sutras and 13 Upsutras. These two volumes of Vedic Mathematics give an insight into these Sutras and Upsutras. The books aim to initiate unfolding process of Ganita Sutras, which can transcend the reader through the existing mental blocks and thinking processes. The book will be useful to not just students and teachers but for all those who wish to learn Vedic Mathematics. N.B. for some reason this book and "Vedic Mathematics Basics" details get mixed up on the internet. iii. Installation of Shiv lingam at the centre of the mystic symbol. 10.Manifested formats to their transcendental bases. Vedic Mathematics Basis of English language (of Orthodox and Classical formats). Dr. S. K. Kapoor’s book is a text that will reward determined study, illustrating how the Vedic system approaches the whole range of knowledge as a single discipline. So we see here how language, multidimensional spaces and the subtle laws of number can work together to express and explain this special area of knowledge. Since creation has so many layers, facets and aspects it is not surprising that it can be comprehended in many ways each of which sees the universe and its organisation, coordination etc. in different terms. The elegant Sanskrit language, the vast spaces of geometry and the subtle approach of number all describe in their structure, and express in their application, ways to understand the seemingly limitless range of experience of the creation on so many levels. In this book the author brings these three together in explaining and analysing the Pingala Chandas Vedanga, one of the basic scriptures of Vedic mathematics, Science and Technology. This ancient work is one of the six Vedangas (auxiliary texts) of the Vedas which describes the science of composition of the hymns of the Vedas. It is an extraordinary and profound work which has been the subject of study by scholars for many years. Dr S. K. Kapoor’s book is a text that will reward determined study, illustrating how the Vedic system approaches the whole range of knowledge as a single discipline. So we see here how language, multidimensional spaces and the subtle laws of number can work together to express and explain this special area of knowledge.